Wednesday, February 6, 2019 – Van Andel Arena, Grand Rapids, Mich. The Manitoba Moose (20-21-3-2) couldn’t hold on, falling 2-1 to the Grand Rapids Griffins (27-15-3-4) at Van Andel Arena, Wednesday night. The Moose controlled most of the opening period with Brent Pedersen registering a couple of solid chances. Off a faceoff, Pedersen flipped a puck on net, it found it’s way past Harri Sateri before the Griffins scrambled to keep it from crossing the goal line. In the last five minutes of the opening frame, the teams traded 30-second power plays on either side of some four-on-four action, but couldn’t find an opening goal. Manitoba led the shot category 8-5 as time ran out in the first. 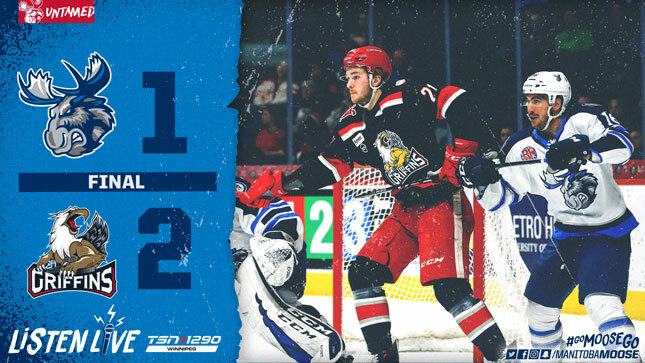 The Griffins took over momentum early in the second frame aided by an early Moose penalty. Eric Comrie stood tall, stopping a total of 15 shots in the middle period and keeping Grand Rapids off the board. Manitoba broke the deadlock at 18:29 of the second when Skyler McKenzie whistled a shot below the glove of Sateri off the rush. The clock ticked down and the Moose went to the break up 1-0. Manitoba was able to keep the Griffins at bay for most of the third period. Tucker Poolman had several chances to double his team’s lead, including being robbed on the back door by Sateri within the final five minutes of regulation. Two Moose penalties inside the last three minutes gave Grand Rapids an opening, and they took it. With the goalie pulled and Grand Rapids outnumbering Manitoba six skaters to three, Philip Hronek blasted the Griffins onto the scoreboard at 18:37. Less than one minute later, and still on the power play, Hronek scored on another one-timer from the point. Manitoba couldn’t force overtime in the remaining 25 seconds, resulting in the 2-1 loss. The game was the 100th all-time (AHL/IHL) between the Moose and Griffins. Tucker Poolman is on a three-game point streak with four assists in that span. The Moose start a homestand with two games against the Texas Stars this weekend. On Saturday Feb. 9, the club celebrates Multicultural Night, which will include performances provided by Folklorama performers. On Sunday, Feb. 10, it’s Polar Bear Jersey Day in support of the Assiniboine Park Zoo Polar bear Rescue Team. A specialty jersey will be worn by the team and auctioned off on the concourse during the game, as well as online afterwards.